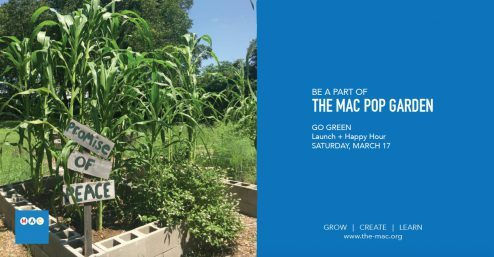 IN PARTNERSHIP WITH PROMISE OF PEACE AND TIERRA FIRME, THE MAC IS PLEASED TO ANNOUNCE THE MAC POP GARDEN: GO GREEN LAUNCH + HAPPY HOUR ON SATURDAY, MARCH 17 IN CELEBRATION OF THE NEW EDUCATION-BASED NATURAL DYE GARDEN. The MAC goes green on March 17 – stop by The MAC and Cedars Socíal Mexican Modern this Saturday! 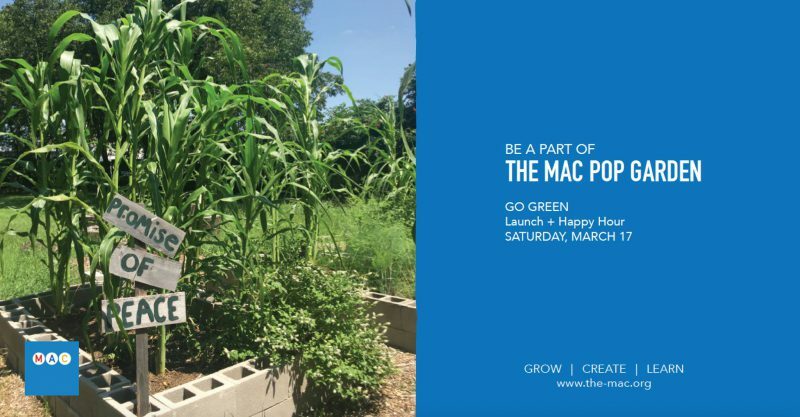 In partnership with Promise of Peace Gardens and art collaborative Tierra Firme, The MAC is pleased to announce The MAC POP Garden: Go Green Launch + Happy Hour on Saturday, March 17 in celebration of the new education-based natural dye garden. Visitors will learn about the new garden initiative with drop-in tours and art activities for all ages, including a natural dye watercolor demonstration, at The MAC (1601 S. Ervay/entrance at 1600 Gano) from 3-4PM. This garden launch will be followed by a happy hour at The Cedars Socíal Mexican Modern (1326 S. Lamar) from 4-5:45PM, where guests will enjoy exclusive drink specials and complimentary passed hors d’oeuvres, there will be a raffle benefiting The MAC POP Garden. As The MAC continues to utilize the ample outdoor space at 1601 South Ervay as a venue to present works of art accessible to all, the organization extends this mission of public engagement with the founding of The MAC POP Garden. The garden will help to revitalize and beautify the neighborhood given that the quarter-mile stretch of S. Ervay St. from The MAC to Downtown has long been vacant. The garden and art are tools to connect people and increase ecological understanding in an urban environment. The MAC will work with program partners Promise of Peace and Tierra Firme to develop and deliver educational programming. 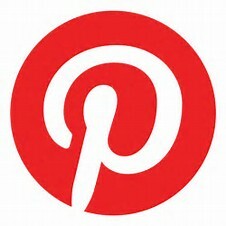 From seed to canvas, participants will learn about each step in the life of a plant, from the origin of a seed, its development over time, and the mature plant’s various uses. Through hands-on educational activities on- and off-site, The MAC POP Garden’s programming will demonstrate how flowers, roots, and other plant materials can be used to produce natural dyes and works of art. The MAC POP Garden is created as a place where art, community, and sustainability connect. Community members interested in assisting with the establishment and maintenance of the garden and/or related activities may contact britain@the-mac.org. Promise of Peace Gardens (POP) transforms vacant spaces into thriving places. POP has built gardens where they deliver programming to children and their families as they explore living a sustainable life. The organization works to grow, harvest and prepare fresh clean food, so children and their families gain access to healthier lifestyles, community involvement and a sense of stewardship for the planet. They have established the Emmanuel POP Garden in partnership with the Emmanuel Lutheran Community Center, the Bayles POP Garden at Bayles Elementary in East Dallas, and a partner garden at Vogel Alcove (across the street from The MAC). POP introduced the “Seed-to-Soul” program at Bayles, which delivers education and hands-on experiences on a weekly basis where teachers and students integrate math, science, literacy and health concepts within the context of the garden. Tierra Firme is a project-based collaboration between artists Analise Minjarez and Sarita Westrup. As individual artists, their practice is grounded in fibers and sculpture. Their art installations often explore issues of duality, authenticity, cultural geography, and migration. Amongst other projects, Tierra Firme worked in various capacities with the University of North Texas Natural Dye Garden. Analise successfully helped with the procurement of grant funding for the UNT Dye Garden and designed and developed the layout of the functioning garden. Both artists have taught workshops throughout Texas and are passionate about the education of natural dyes and textiles as a powerful medium for creating fine art. Recently, Tierra Firme was awarded the 2017 Arch and Anne Giles Kimbrough Fund Award from the Dallas Museum of Art. The Cedars is located just blocks from the heart of Downtown Dallas south of I-30. By car the Cedars is connected to the metroplex from major arteries: I-30, US-75, I-45, and I-35. The neighborhood is easily accessible by DART lightrail and bus.